I made these for Easter.They were soooo good and very easy to make!! A big Thank You to Jeanine at thebakingbeauties.com for posting the most fabulous gluten free sandwich bread recipe I have ever had!! The bread is easy to make and has the taste and texture of the bread I remember eating as a child. *Dariy free substitute sweet rice flour for the skim milk powder. Make sure all ingredients are at room temperature. I place the eggs (unshelled) in a bowl of warm water while I am preparing the yeast. Combine warm water, yeast and sugar in a bowl. Stir and let sit 5 minutes. This allows the yeast to proof and shortens rising time. In a large bowl, combine dry ingredients. Mix well and set aside. Using heavy-duty mixer with paddle attachment, beat eggs until thick and foamy. Slowly add vinegar and oil. Mix on low until well blended. Slowly add water/yeast mixture and mix until combined. With mixer on lowest speed, slowly add dry ingredients and mix until combined. (The dough will have the texture similar to a cake mix-see picture below) Scrape bottom and sides of bowl with rubber spatula. Turn mixer to medium speed, set timer and leave alone to beat for 4 minutes. You can see from the picture below that the dough will begin pulling away from the sides of the bowl. 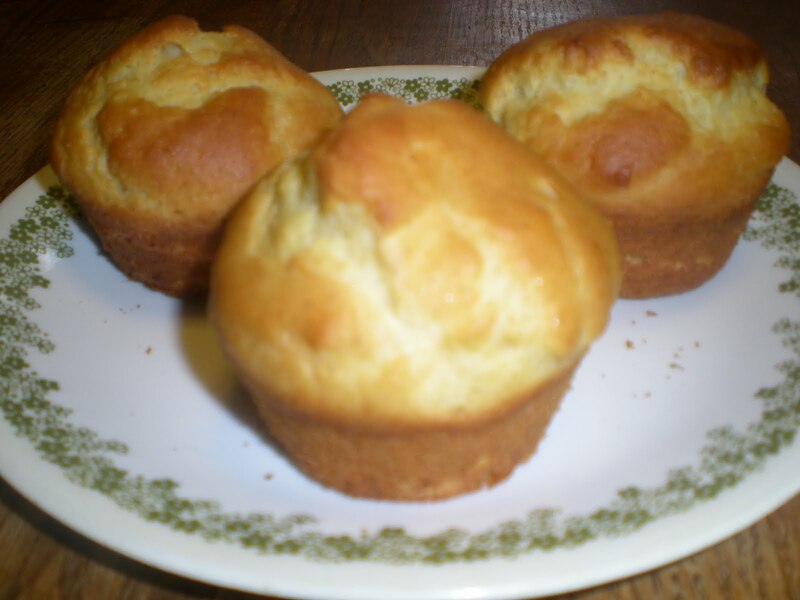 Fill greased muffin tins 2/3 full with dough. Let rise about 20 minutes or until the dough reaches just over the top of the pan. Bake in preheated oven until they just start to brown - about 15 - 17 minutes. Remove from oven and let sit in pan for 5 to 10 minutes. Take out of pan and let cool on a wire rack. If frozen, take out of freezer 1/2 hour before serving and place on plate or cookie sheet. Then proceed to #10 to bake. If unfrozen, place on cookie sheet and bake in preheated 425 degree oven for 7 to 10 minutes or until brown. Oh wow, those look fantastic, Vicki! I've never thought of making them in a muffin tin, great idea! Hmm...now I have the urge to bake bread again. :) So glad to hear that the recipe is working so well for you! Yeah! !